The AGA-T7 by Youde is a durable stainless steel rebuildable atomizer. It features a pyrex glass tube with 1.5ml capacity, but can hold up to 3.5ml of e-liquid altogether when including the juice contained in the chimney section and your wick/cotton. Similar to the Kayfun, it is designed to optimize the flavor of your e-liquid. The wick and wire are housed inside a chimney chamber which funnels the vapor straight up for your enjoyment, resulting in greatly enhanced flavor and lots of vapor! The top cap features a fill hole, which is sealed by a grub screw - simply unscrew the grub screw using the included hex key when you need to re-fill with e-liquid. In addition, the AGA-T7 features an airflow control ring and juice catcher at the base. The AGA-T7 has four posts that are ideal for both vertical and horizontal dual coil builds. It has a gold-plated, sealed 510 connection. 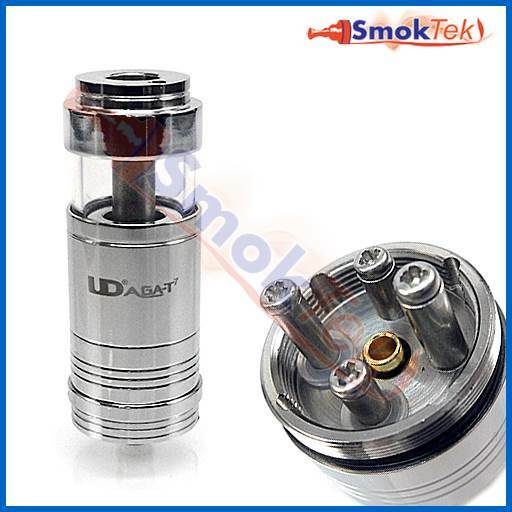 This RBA will work with most 510 drip tips (drip tip not included with this unit). It is very easy to disassemble. With this unit, you will receive a short user manual and spare parts packet containing wick and wire, o-rings, a washer, a spare screw and a hex key. Please note that a spare grub screw for the fill-hole is not included. Notes : Not for inexperienced users!